How do you trade one of the biggest reports on tap this week? Here are a couple of tips and tricks for the U.K.’s jobs data! What’s the report all about? 1. The claimant count change counts the number of people claiming unemployment-related benefits every month (the lower the number, the better). 2. The unemployment rate measures the number of unemployed workers and is measured once every quarter (the lower the rate, the better). Market players watch the jobs data closely simply because the Bank of England (BOE) uses this data to help guide their monetary policy decisions. If you recall, the central bank’s forward guidance strategy states that it will continue to purchase assets to stimulate the economy until the unemployment rate reaches around 7.0% or if the BOE thinks that the inflation rate will reach 2.5% or more in the next 18-24 months. How does GBP/USD usually react? With the U.K.’s jobs numbers exceeding market expectations since April, the bullish British Pound reactions are not surprising in the past two releases. GBP/USD traded in a tight range up until the report’s release. Thanks to a better-than-expected claimant count change, the pair broke to the upside and even continued its move up until the start of the U.S. session after a short pullback. Like in August, we saw a tight range, an upside breakout, pullback and finally, an extended move. The breakout was more pronounced this time around though since the unemployment rate also dropped from 7.8% to 7.7%. Heck, the pair didn’t even retrace during the U.S. session! 1. Trade the breakout. GBP/USD tends to consolidate tightly early in the day, so setting orders above or below the Asian session range could be a good news trade strategy. Just make sure you account for widening spreads and/or slippage during the news release! 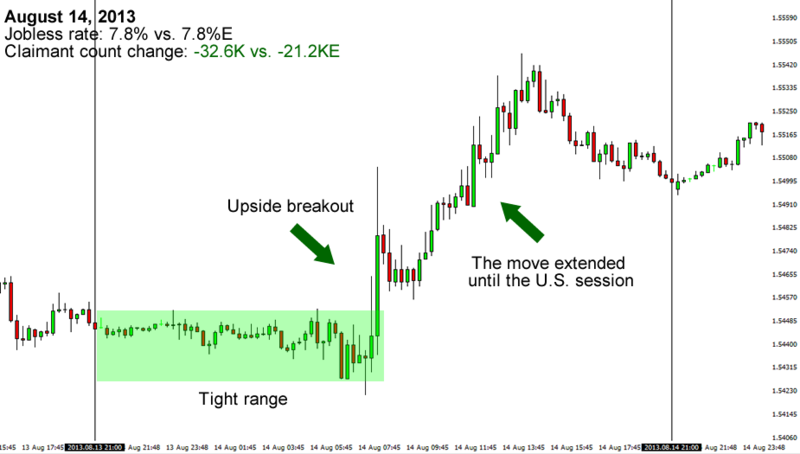 Pull backs have occurred before, so think about where you want to take a quick profit. 2. Trade the extended move. We saw that without any major news from the euro zone or the U.S., GBP/USD tends to extend its move, at least until the start of the U.S. session. 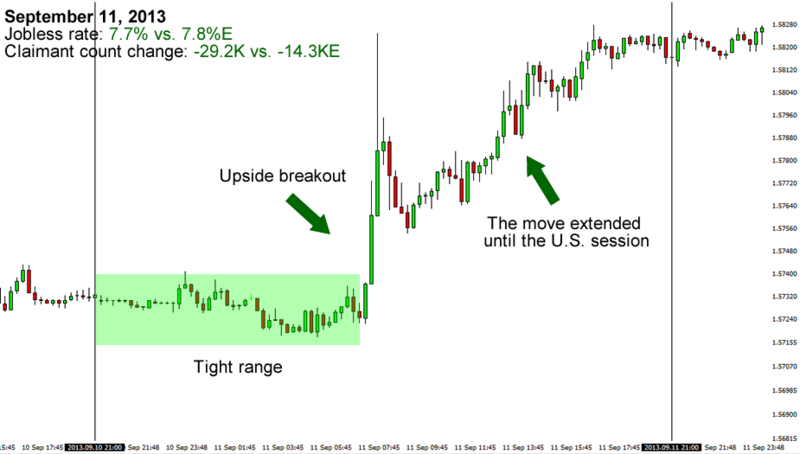 If you don’t want to trade the potential spike at the release, then you can also wait for a short retracement and then target an inflection point in the same direction and close some time during the U.S. session. 3. A word of caution. Even though the U.K.’s reports have been coming in better-than-expected for the past few months, it doesn’t mean that we’ll see the same thing this time around. In fact, I wouldn’t be surprised if the jobs data becomes the next victim of the U.K.’s latest string of disappointing reports! Just don’t forget to prepare for every scenario you can think of, alright? That’s it for this trading guide! If you’re planning on trading this one, remember to plan your trades and trade your plan. Good luck and good trading!